The jewellery is usually 1.6mm (14 gauge) but can sometimes be 1.2mm (16 gauge) and the length of the bar (measured between the 2 balls) can be anywhere between 30mm and 50mm. Ocassionaly the piercings will have Ball Closure Rings initially to speed the healing process but this can cause problems with the holes not being correctly aligned when healed. 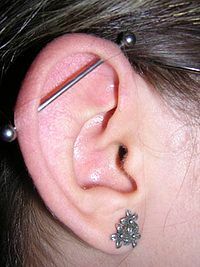 The usual healing time can be anywhere between 3 months to 1 year for an industrial piercing and the piercing can be quite painful. We have just taken delivery of some fantastic new Industrial Barbells that have removable adornments that simply slide up and down the bar to aid easy fitting of the barbell, they can also be removed completely so the bar can be worn plain, or they can be popped onto another bar. Designs include cherries, flowers, hearts and stars. They are available on 316L Surgical Steel Bars or 6AL-4V Barbells in a choice of 12 different colours in lengths of 30mm through to 50mm. "I have been ordering from here for a few years now and I have never been disappointed as yet. Every item is good quality and long lasting and it is..."